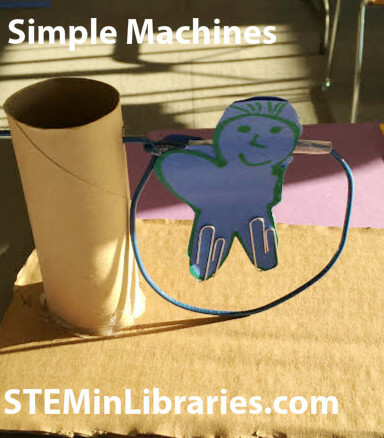 Brief Description: Learn the basic mechanics of simple machines, then build one of your own. 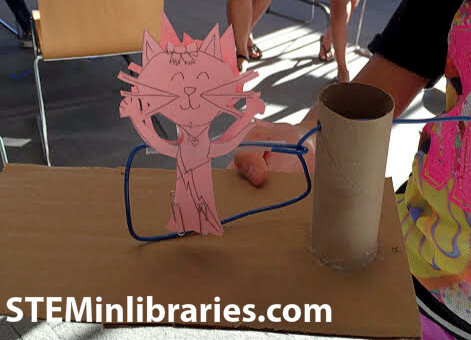 Optional: Pre-build cardboard base out of cut, narrow, lengths of cardboard and toilet paper tubes. Glue the toilet paper tube to one end of the cardboard length. Also optional: Mark when end of the cardboard base with a star, the other with a triangle, to help differentiate the two sides in the instructions. 1. Provide a brief explanation of what a simple machine is, and the 6 types of simple machines there are. This site and this site have good explanations to use as reference. 2. Demonstrate the two simple machines that will be built: the jumping machine, and the dual motion machine. Have participant identify what simple machine the models are based off of. 3. Give participants choice of what machine to start with, and hand out instructions accordingly. 4. With supplies set out around the room at stations, have participants gather their supplies and work on their chosen machine. 5. If time allows, let participants build the second machine. Otherwise, send supplies and instructions home if they wish to build it there. The instructions for the Jumping Machine were inspired and modified from this source. The instructions for the Dual Motion Machine were inspired and modified from this source. A note regarding supplies for this machine: we opted to use pipe cleaners, as opposed to paperclips as listed in the inspiration post, as they are more easily manipulated by young hands. However, the pipe cleaners need to be just right: not too fluffy, not sparkly, and a bit stiff; the pipe cleaner would not move freely if it was too fluffy, sparkly, or limp. If the ends can be covered safely, using smaller sections of the floral wire would work well, and perhaps better, instead. Overall, this was a very interesting program to run. The tweens were self-directed throughout, relying on the instructions and each other to build their machines. The biggest issues we faces were in regards to the pipe cleaners. As noted in the procedure section, we discovered that not every pipe cleaner is created equal, and some worked better than others. For future programs, we would test the pipe cleaners used first, or switch them out with a better material- wrapped floral wire being one option. 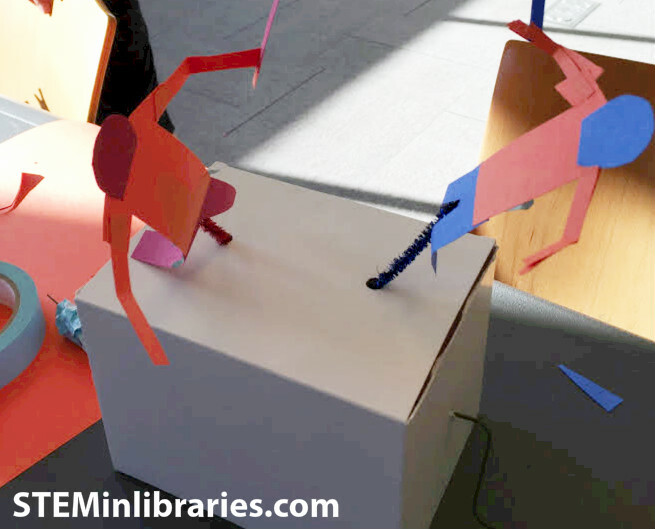 Additionally, this program was planned with the intent of each tween making two machines. Out of 25 participants, only 2 managed to start a second machine. With this in mind, the planned program could actually be held as two separate programs, with only one machine as the focus of the event. This program could easily appeal to an older audience- teens would easily be able to follow the written instructions and build both machines in the time allotted. Additionally, they would enjoy the creative freedom to modify the designs as they set fit. This program cannot easily be adapted to a younger audience, as the dexterity needed to bend and twist the different components would be too difficult for younger hands. To bring this program to younger participants, it would be best to do so in a family program, where parents are on hand to help.